Directions: Take HWY 85 1 Mile South of Shoal River to Rattlesnake bluff Rd, Then just over 3 miles to the ”Y” & bear right on Regan, then immediate right on Hassell rd. House on right after corner house. Directions: From E HWY 90 turn North on Rose Bud Avenue. Turn left on Bobolink Way. Follow to house on left. Remarks: Home is situated on large lot off a quiet road. Kitchen has beautiful wood cabinets and stainless steel stove. Wet areas are ceramic tile and all other flooring in carpet. Split floor plan allows for privacy while the living room, dining and kitchen are open and airy. Home has several linen/storage closets for storage space. Directions: From the intersection of Highway 85 and Highway 90, go west on Highway 90, then turn right (north) onto N Lloyd St (next to McDonalds). Turn left (west) onto North Ave. Property will be on the right at the corner of North and Seminole. Remarks: Don’t let the age fool you, this home is cute as a button and ready for new owners! This neat all-brick home on a corner lot has been totally refreshed inside and out with new carpets, new neutral-toned paint, and a new dishwasher. Large mature trees dotted around the lot provide plenty of shade in the warmer months. This home offers a single-car garage around back as well as a fenced backyard (perfect for pets) and a nice-sized covered front porch. The wrap-around kitchen with breakfast bar provides plenty of cabinets and counter space. The dining area and living room are open to each other. Conveniently located in town, this home is less than a mile from Northwood Elementary and Pic-n-Sav and about a mile from CVS. Schedule your showing today! Subdiv: HOMESTEAD MANOR S/D ImmOcc? Dir: Hwy 85 North to Airport Road, right. To Hilary just past stafford estates, turn left on Hilary. 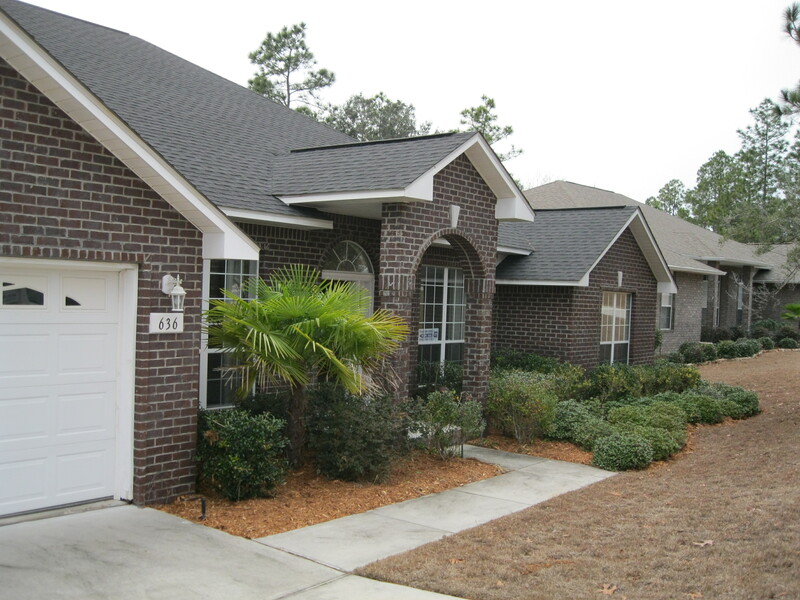 Home is located on a quiet culdesac with sidewalks and decorative street lights. 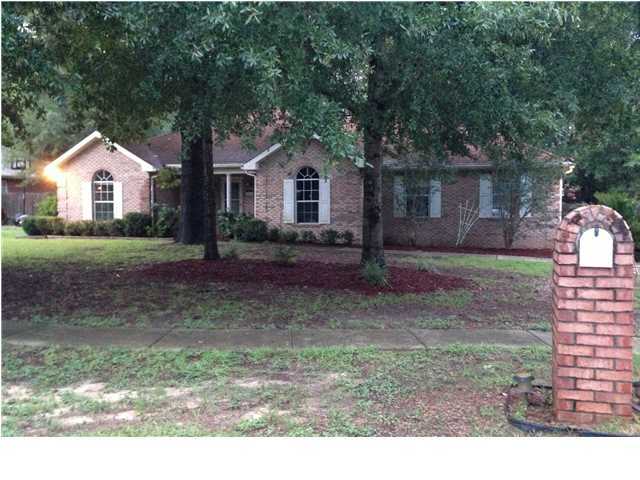 Enjoy the large Oak trees in the front and back yard. Back yard has a privacy fence and storage building for your convenience. From the quiet outdoors walk into a comfortable home featuring a large living room with laminate flooring and a corner fireplace. The room off the foyer can be used as a study, office, sitting area, or just a cozy place to curl up with a good book. The large 25X25 fourth bedroom can also be used as a family room. Kitchen features custom cabinets, a new smooth surface range with built in microwave and a new side by side refrigerator. All light fixtures and ceiling fans have been updated. Roof was replaced in July 2005 with dimensional shingles. Enjoy your evenings on the lanai out back or on the covered front porch. One year home warranty offered. Call today to have a look at this must see home. A trip well worth making. Subdiv: LANTERN RIDGE S/D PH 1 ImmOcc? Dir: From the intersection of Highway 85 and Highway 90, travel east to Valley Rd. Turn left onto Valley Rd and then turn right on Palmetto Dr. House will be on the right. This conveniently-located home needs some TLC. With some new carpets, fresh paint, and some fix up, this could be a great investment. Lantern Ridge is just over a mile from Twin Hills Park and close to schools and shopping. Large family room with vaulted ceiling and a fireplace. The master suite is on the first floor. Fully privacy-fenced backyard with two patios. PROPERTY TO BE SOLD “AS IS”. From the intersection of Highway 85 and Highway 90, travel east to Valley Rd. Turn left onto Valley Rd and then turn right on Palmetto Dr. House will be on the right. Affordable country living! 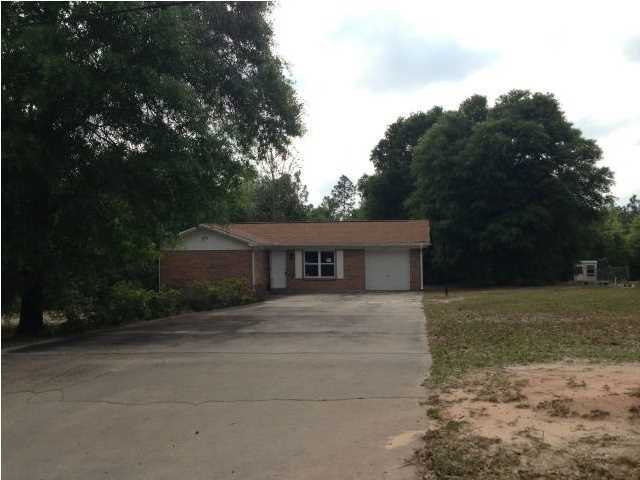 3 bedroom/1 bathroom all-brick home located on a full acre lot on a paved road. Large driveway with single-car attached garage. Newer vinyl flooring in the eat-in kitchen and bathroom and carpets in all other rooms. Appliances are also newer. This home is a blank slate just waiting for a touch of imagination. PROPERTY TO BE SOLD “AS IS”. 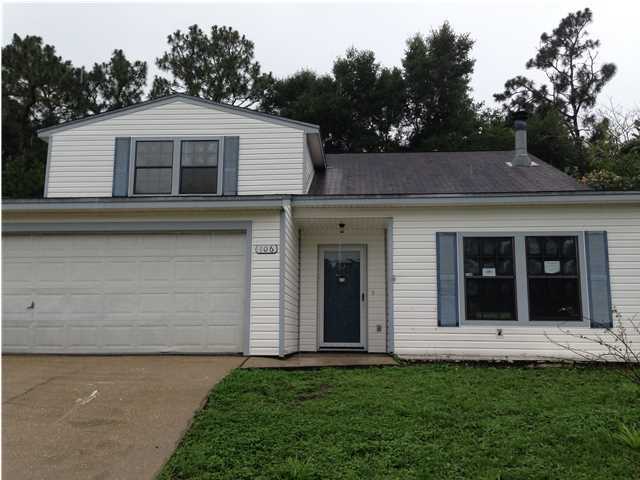 With a little TLC this affordable three bedroom, two bathroom home would be a great deal for the first-time homebuyer on the north side of Crestview. The convenient location offers a country setting less than ten minutes from Winn-Dixie, Davidson Middle School, Crestview High School, the Post Office, and the new Marquis 10 Theater. Enjoy watching the beautiful azaleas bloom right out your front window. The half-acre lot is level, providing ample room for a pool or a garden. The sliding glass door in the dining room leads to the open patio in the completely fenced back yard, with privacy fence running along the back and one side. Plenty of parking with a two-car garage and the shingle roof was replaced in 2005. The home, along with shed and wooden swingset/jungle gym convey “as is.” This property is approved for HomePath Mortgage and HomePath Renovation Mortgage. Find more information at Homepath.com. Dir: From I-10 take the Crestview exit South on Hwy 85. Turn right on PJ Adams. Follow PJ Adams for approx. 4 miles (crosses back over I-10). Entrance to Fox Valley subdivision on left (Fox Chase). Stay right on Fox Chase to Territory Lane. 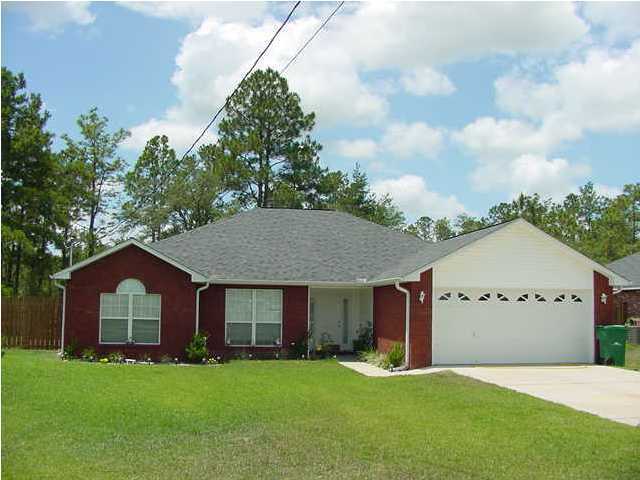 BEAUTIFUL ALL BRICK FOUR BEDROOM TWO BATH HOME LOCATED IN SOUTH CRESTVIEW. SIDEWALKS THROUGHOUT THE SUBDIVISIONS FOR THOSE EVENING WALKS AFTER DINNER. NO SEPTICS, HOMES ARE ON SEWER. Standard features include fireplace, trey ceiling in MB, fully-sodded lot, sprinkler system, walk-in closets, wide colonial baseboards, NAFCO tile foyer, 5/8 sheetrock in all ceilings, rounded corners in common areas, large plant ledges, pre-wired for security and surround-sound, On Q Home Wiring System, telephone jacks w/CAT 5 Wiring in all bedrooms and kitchen, cable jacks in all bedrooms, double vanities in MB, 30-yr. Dimensional Shingles, steel garage door with decorative glass, insulated steel exterior doors. follow me on Twitter click the twitter image. Dir: From I-10 Crestview exit head South Highway 85; East on John King; left on primrose; Right on Lost Creek; left on Young Rd, at the end make a right on balboa home is at the end of the cul-de-sac. Beautiful David R. Smith custom home in South Crestview on over 3/4 acre lot! Formal Dining Room, fireplace, eat-in kitchen, utility room/pantry, covered back porch. Luxurious master bedroom suite has 2 bedrooms(great to use for a computer room, nursery, exercise room, etc. ), garden tub, separate shower and lots of closet space. o This is a Fannie Mae HomePath property. o Purchase this property for as little as 3% down! 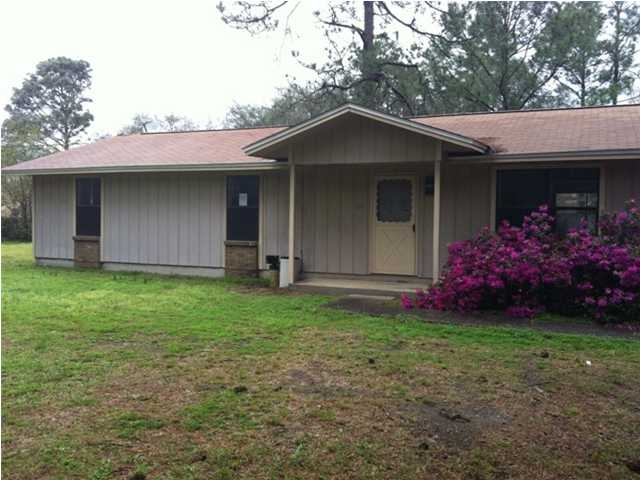 o This property is approved for HomePath Mortgage Financing. o This property is approved for HomePath Renovation Mortgage Financing.